While the first Hotel Transylvania wasn’t great, it was an enjoyably silly family film with some extremely energised animation and designs by veteran animator Genndy Tartakovsky. More significantly, however, it was also one of Adam Sandler’s better films in years, with the much-derided actor not only being given material that was actually funny and just the right amount of child-friendly without being juvenile, but also a character that was genuinely likable and extremely fun to watch. Now, with Pixels having died a slow and painful death with both critics and audiences this summer, and with his star even more diminished now than it ever was, Sandler desperately needs life support and a ray of hope to potentially see that he needs to start actually making worthwhile movies again. Thankfully, Hotel Transylvania 2 is exactly that; while it’s not an instant classic like the first, it’s just about as enjoyable and funny in our opinion. 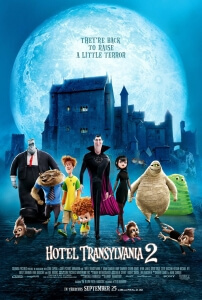 Sandler once again voices Dracula, the owner of the titular resort where monsters and now humans come to stay, who is beyond delighted when his daughter Mavis (Selena Gomez) gives birth to a half-vampire and half-human son Dennis (Asher Blinkoff). Eager to bring out the vampire in his grandson, Dracula and his monster buddies Frankenstein (Kevin James), werewolf Wayne (Steve Buscemi), Murray the Mummy (Keegan-Michael Key) and Griffin the Invisible Man (David Spade) set out to inspire young Dennis with several escapades of monster activity – but of course, things don’t go according to plan. Much like the first film, it takes advantage of all possible opportunities to deliver a fun and comfortable ride for families; kids can be attracted to the colourful and speedy nature of the animation, while the adults can laugh at the pure silliness that’s going on in the background or foreground. Tartakovsky, best known in the animation field as the creator of cult shows Dexter’s Laboratory and Samurai Jack, has a distinct style that is all his own, and it shows constantly here in the fast-paced movement and unique designs of characters and settings. He is most certainly one of the more singular animators working today, and even in a more commercial product like Hotel Transylvania he still manages to exhume such strong passion for his work and visions. Tartakovsky is working from a script that is co-written by Sandler, and though that would normally be cause for alarm (especially for a sequel to a film he didn’t write) it’s safe to say that this is most definitely his funniest contribution in years. Not every joke works, with one or two punchlines being disappointingly predictable, and some of the Sony product placement is rather blatant, but the majority of them do and it’s enough to class this as one of the few animated sequels that’s actually funnier than the first. It comes at a small price, though; a little bit of the heart from the first is lost in the mix, with the focus this time being purely on delivering as many silly-but-funny jokes as possible. There is certainly an element of the heartfelt nature left, and the characters are still very likable and funny, but whereas the first film managed to balance it a little better it’s clear which side this film leans more heavily towards. The good news is that a lot of the jokes are, amazingly for an Adam Sandler movie – especially one that he co-wrote – very funny, and the time breezes by thanks to the enormous amount of giddy fun that is being had. By the time the third act comes by, when things start to fall apart thanks to the inclusion of a late and unnecessary villain, it becomes exhausting but in a way that is never overbearing. We’d say that, for the most part, Hotel Transylvania 2 is a perfectly suitable follow-up to a fairly decent movie, and both films go hand in hand as equally good and enjoyable. This leads us into an interesting situation, regarding Sandler’s fading stardom. Pixels, his most recent live-action offering from his Happy Madison production company, was a critical and commercial bomb, following other recent flops like Blended and That’s My Boy, also from the same company. Both Hotel Transylvania movies, however, were produced solely through Sony Pictures Animation, and though Sandler and regular collaborator Allen Covert are listed as executive producers Happy Madison had next to nothing to do with it, and both movies have (so far) been reasonably successful with critics and at the box office. It’s become very much apparent that, in order for Sandler to get back on good terms with the movie-going public, he needs to open up more to collaborating with other filmmakers and studios rather than just sticking to the status quo and delivering nothing but dumb fart jokes and the kind of low-brow humour that brought him here in the first place. He needs now more than ever to recognise that changing his ways and evolving with the times – in other words, to grow the hell up – is the healthiest thing he can do right now, and it’s quite unbelievable that an animated family film by Sony is the one to hopefully open him up to that possibility. Let’s just pray that Sandler receives this wake-up call, and doesn’t go on to make Grown Ups 3 instead. Hotel Transylvania 2 is just about as entertaining as the first film, with the fast-paced animation and genuinely funny humour lending it some favours, and offers a glimpse of hope that Adam Sandler can still be good when he wants to be.